Title: Universi Orbis Descriptio. Publication: Geographiae universae tum veteris, tum novae absolutissimum opus... Auctore eodem Io. Anto. Magino Patavino..., Cologne 1597, Petrus Keschedt. 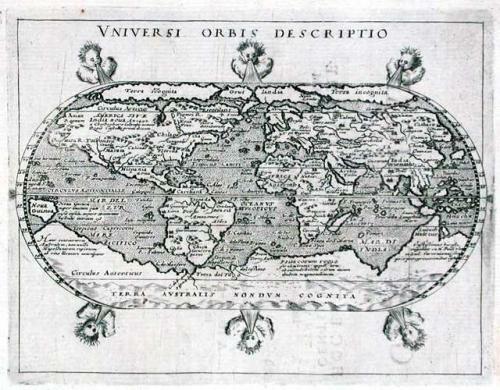 A map of the world on an oval projection, after Ortelius, with six unnamed windheads arranged around the outside border. Text on verso. Shirley writes that the engraver reduced Ortelius' much larger map to octavo page size with very little loss in legibility. The landmass above N. America was initially labeled as Terra Icognita, but the engraver must have noticed his mistake shortly afterward since the letter 'n' was subsequently added. South America has an unusual bulge on its west coast. Speculative north-west and north-east passages have been incorporated. Numerous mythical islands have been inserted.